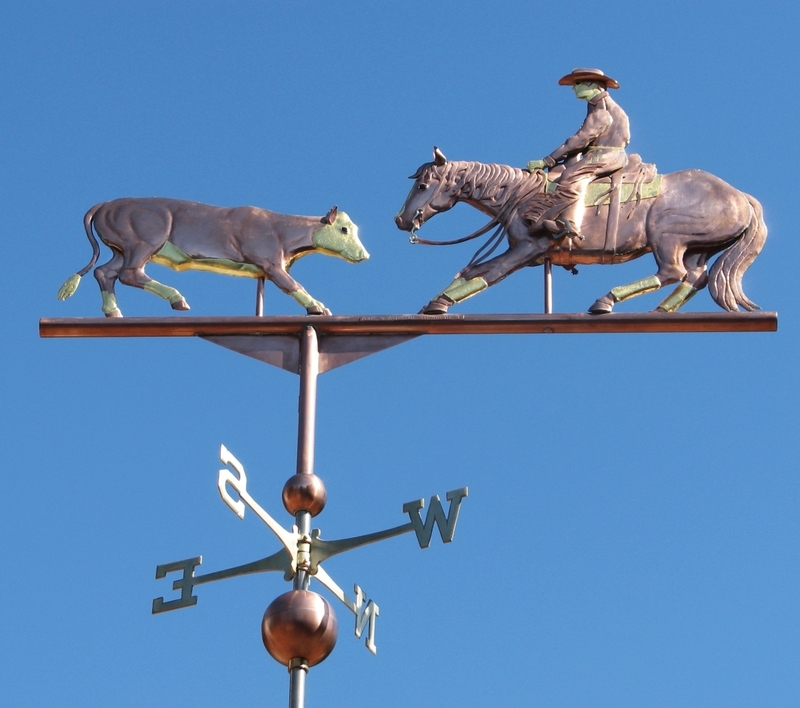 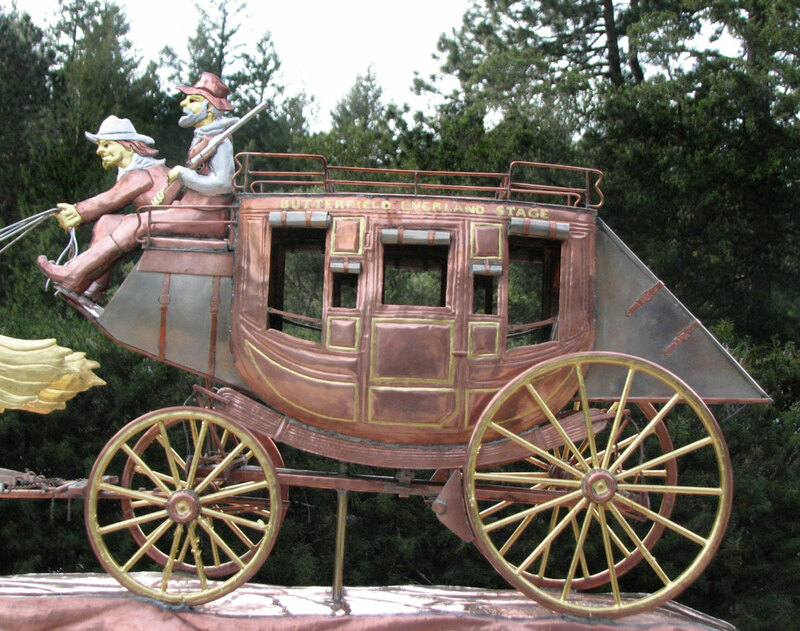 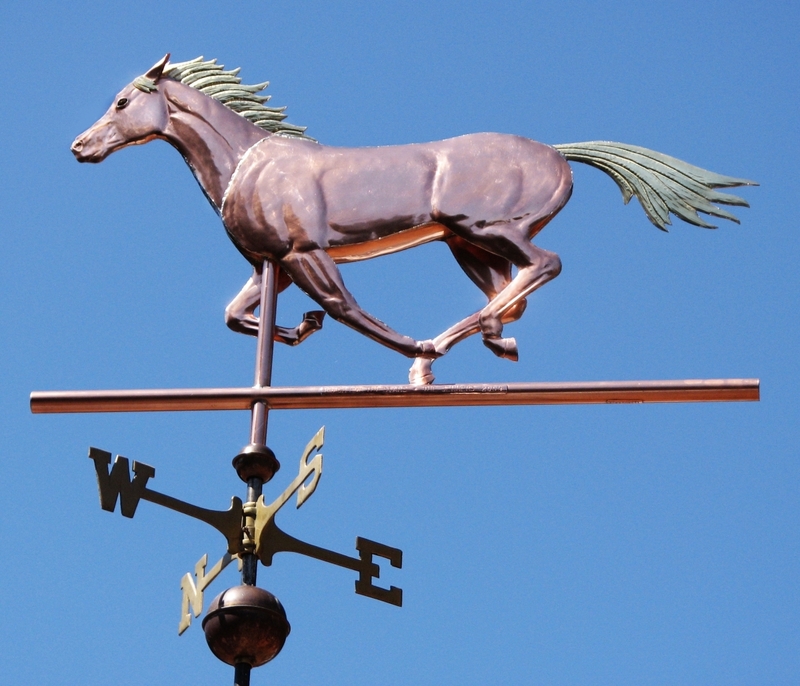 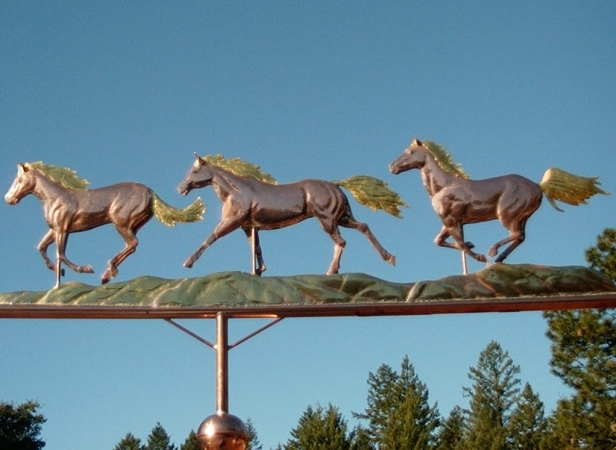 This Stagecoach Weather Vane is an all time favorite weathervane project here at West Coast Weather Vanes. 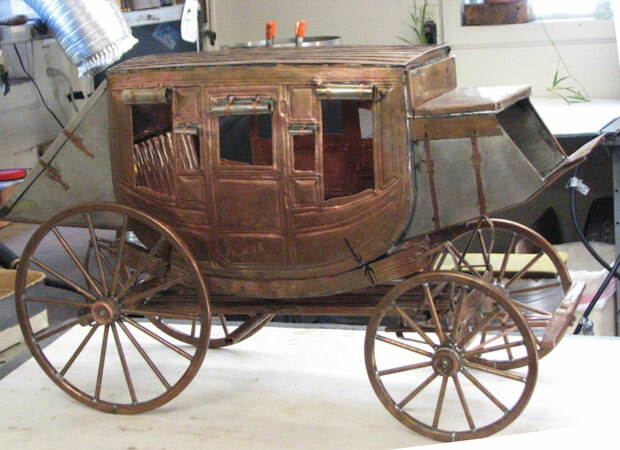 We were approached by a customer whose family owned land near the Butterfield Overland Mail Stagecoach Company’s route through Southern California. 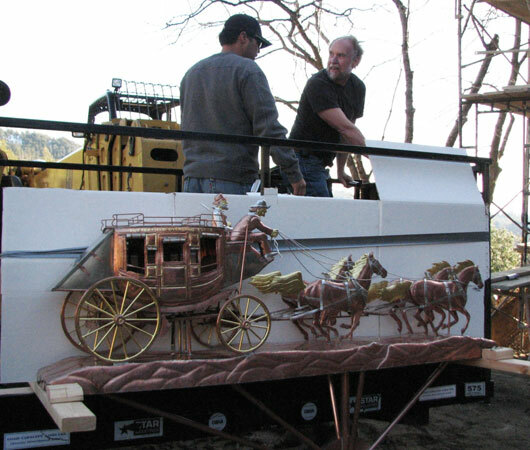 He was interested in having a scaled down replica of a Concord Stagecoach made, complete with drivers and a team of horses to be mounted on top of a peaked tower on the new home he was building on the property. 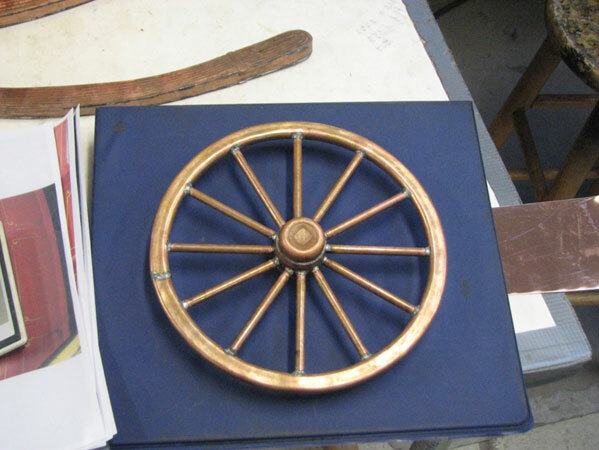 It sounded like a fascinating project and we were definitely game to give it a go. 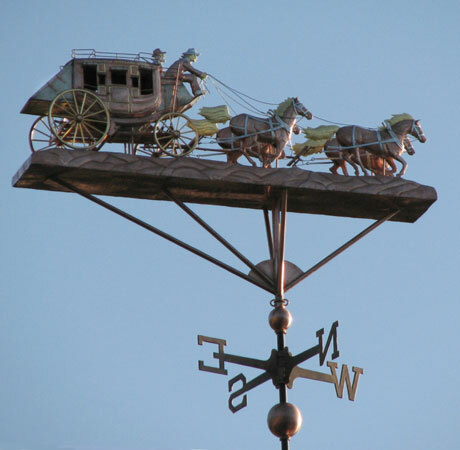 Stylistically, the Stagecoach Weathervane is of hybrid construction, partly a fully 3-D weathervane and partially a highly detailed swell-bodied weathervane. 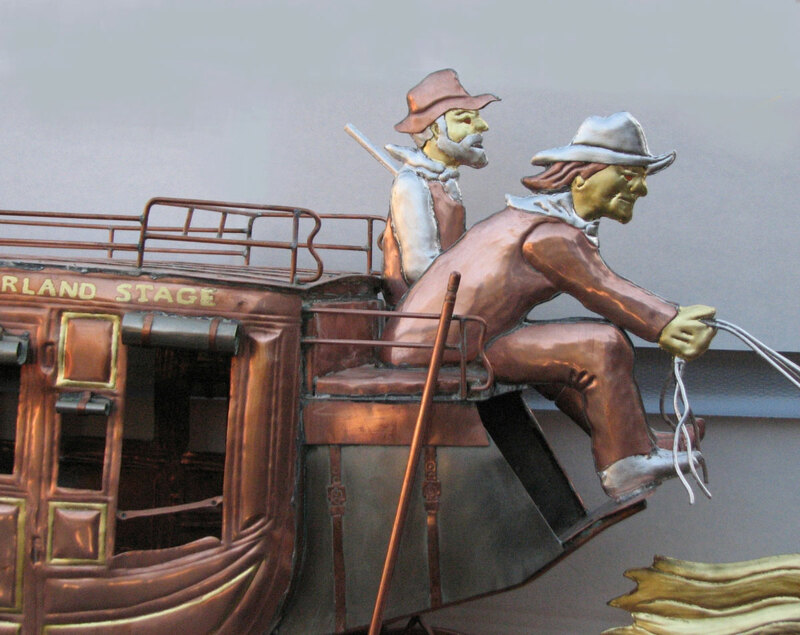 The stagecoach and hillside platform are fully 3-D, while the horses and drivers are swell-bodied. 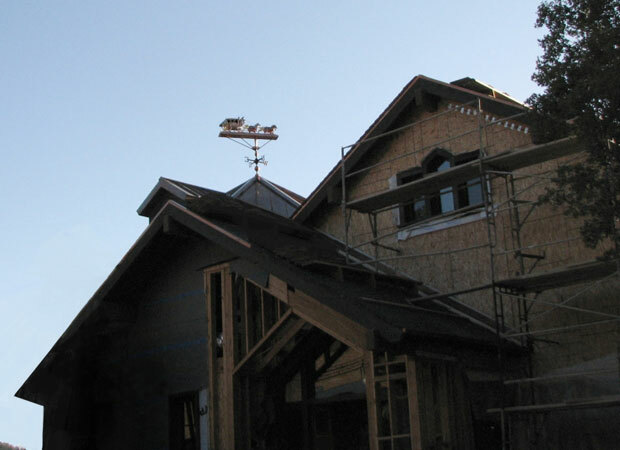 Hybrids such as this are unusual, but the integration worked out very well. 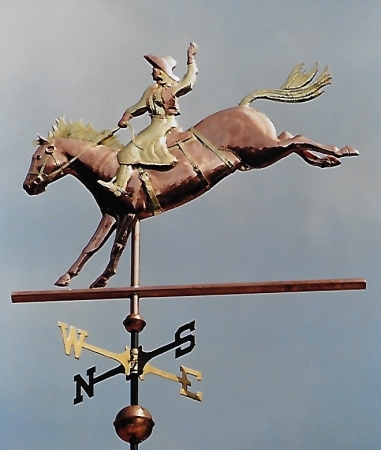 The weathervane was quite large, over 4-feet long and weighed almost 100 pounds necessitating some substantial bracing, especially since it was going on the side of a mountain above 7000 feet in elevation, subject to high winds and snow. 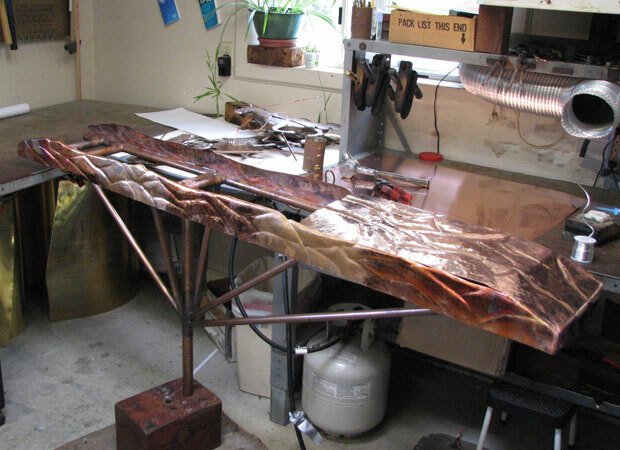 The primary metal used was copper but we also added nickel silver and optional gold and palladium leaf. 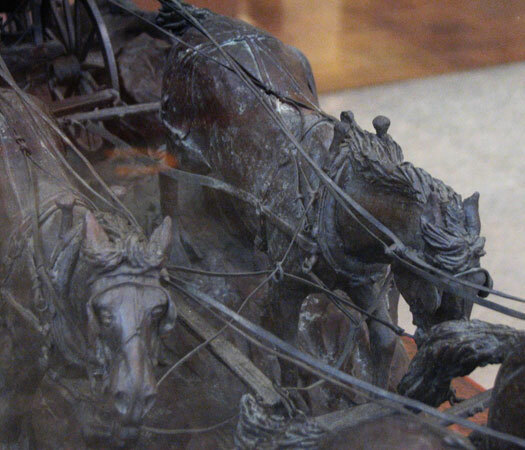 The horses had brown glass eyes with black pupils and the drivers had translucent glass eyes. 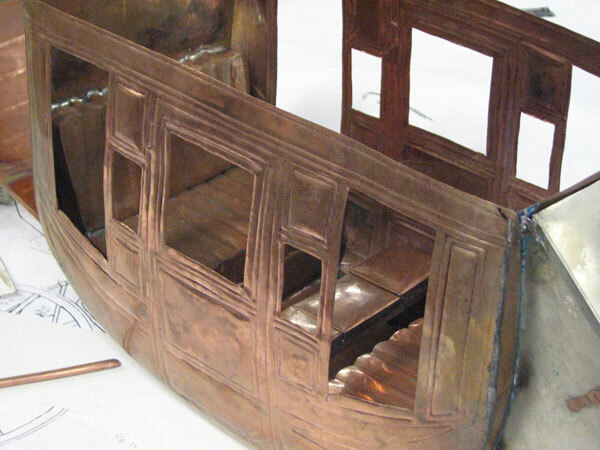 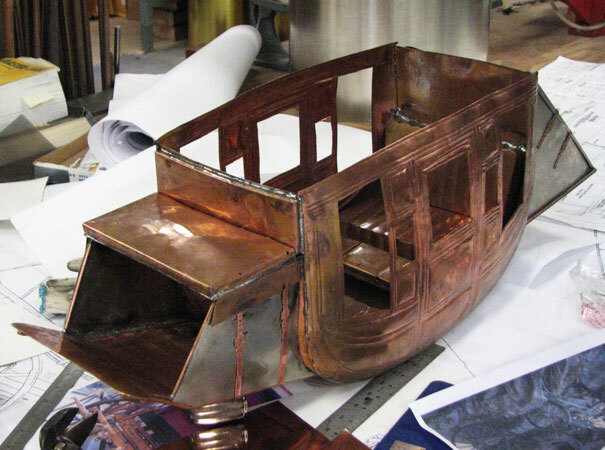 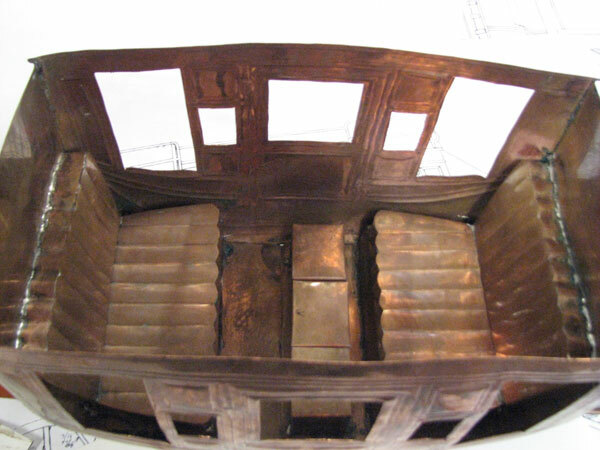 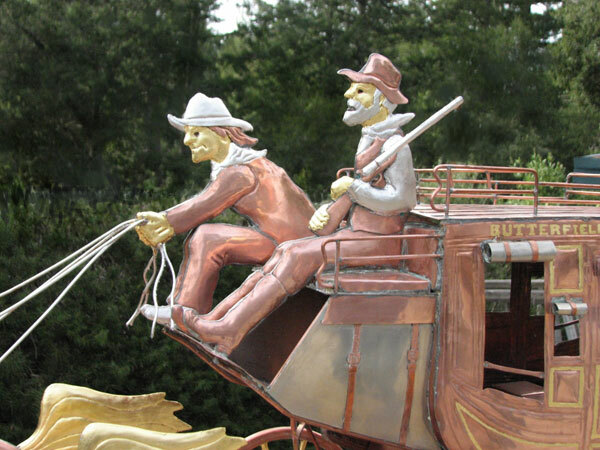 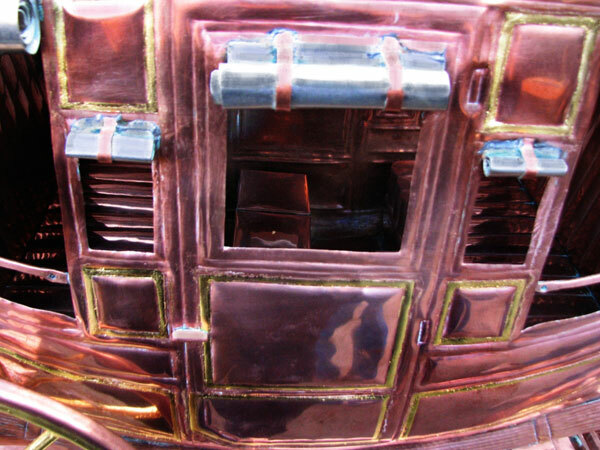 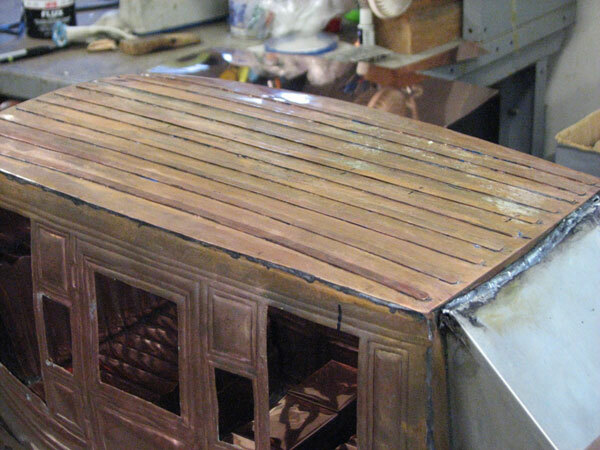 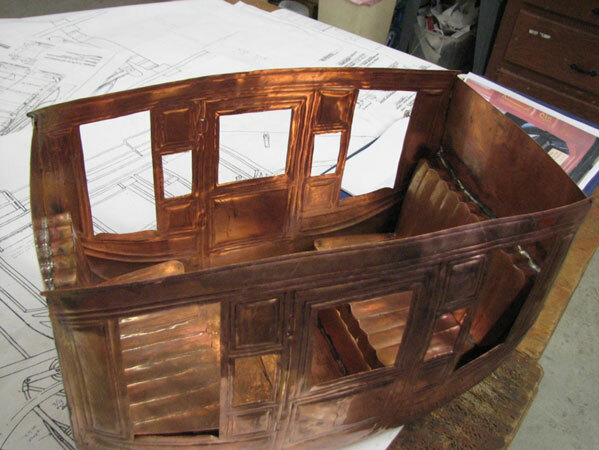 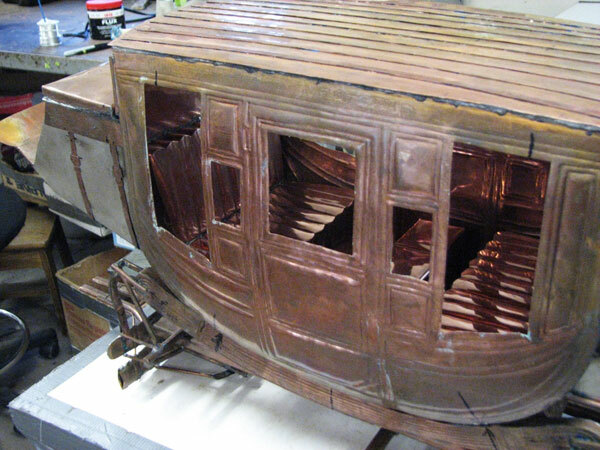 In the last photo, you can see a gold nugget on the seat inside the stagecoach. 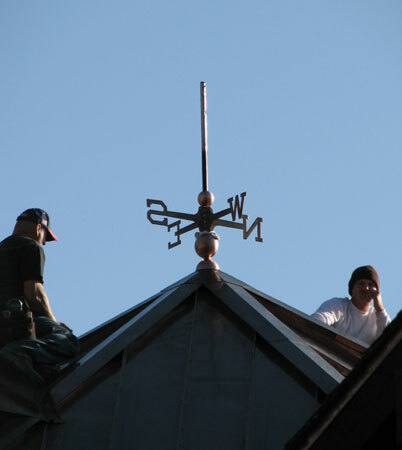 This small nugget was found on the property by one of the construction workers. 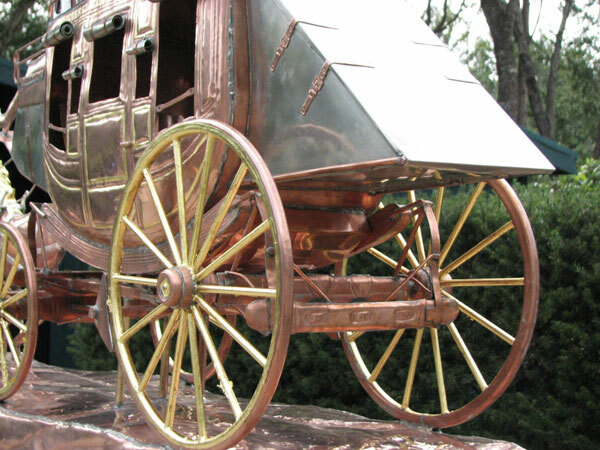 If this stagecoach was full sized, that would be one very large gold nugget! 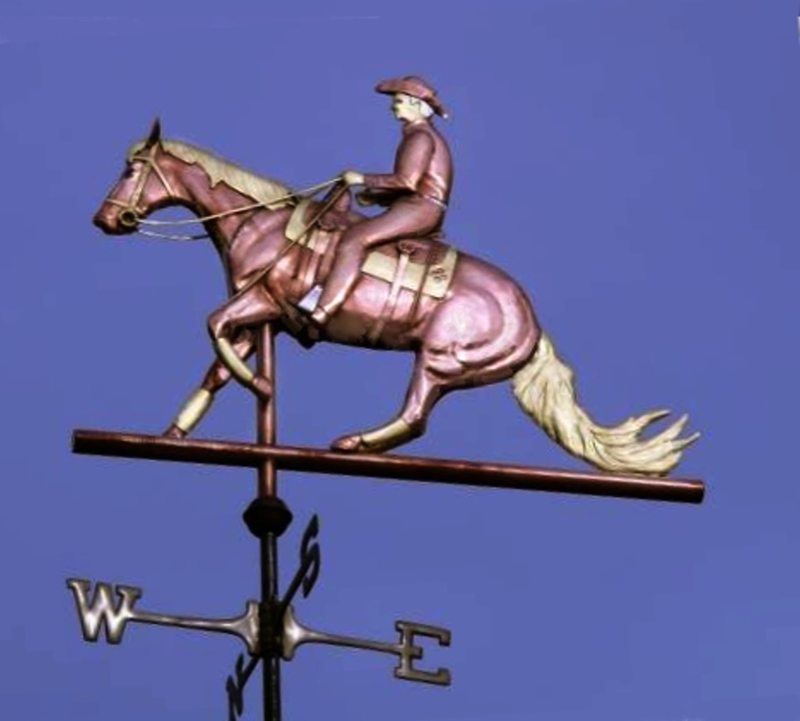 While this Stagecoach Weathervane may be the most elaborate weathervane we’ve made to date, it could also be made as a simple silhouette weathervane or a swell-bodied weathervane. 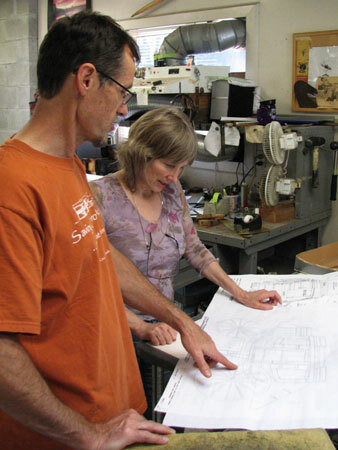 We always try to work with our customer’s budget as well as their vision. 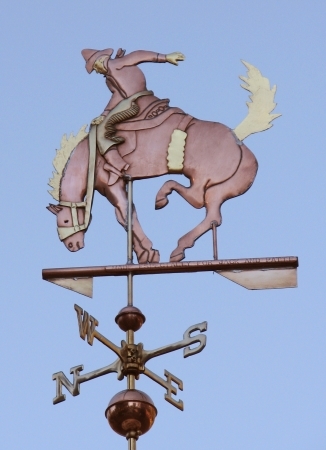 If you are interested in a stagecoach weathervane but would prefer something simpler, please give us a call. 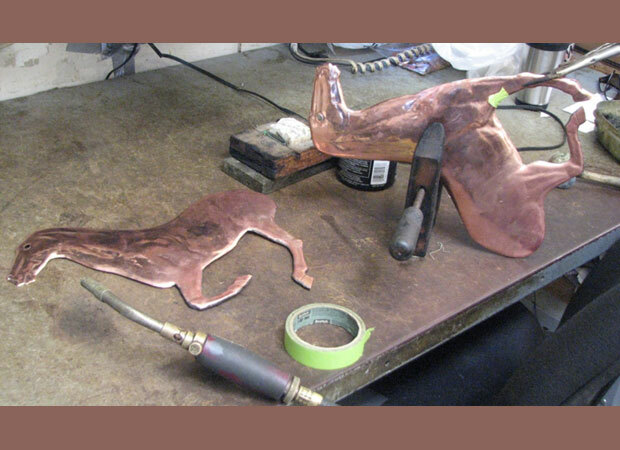 We would be happy to discuss ideas with you. 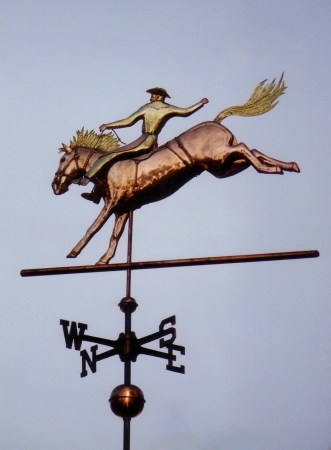 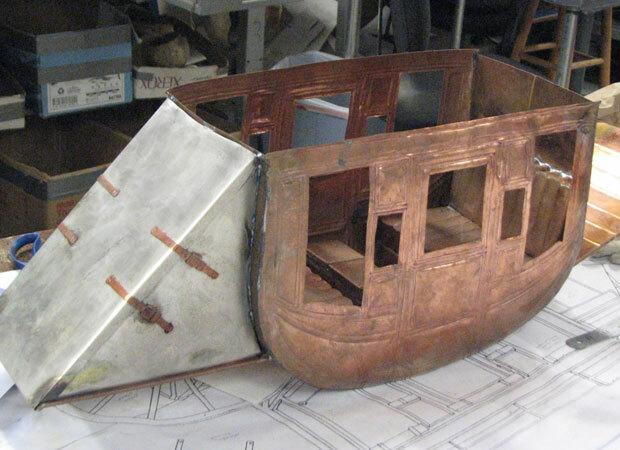 If you are interested, the sections below tell more about how we put together this weathervane. 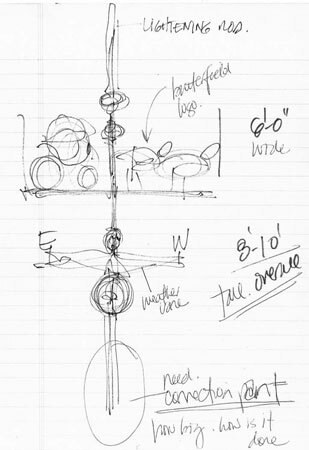 Click on the small green downward facing arrows for additional information. 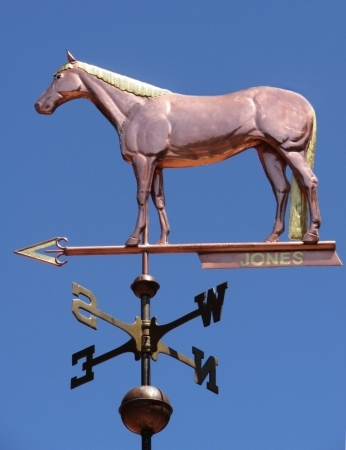 The design process for this weathervane was quite extensive. 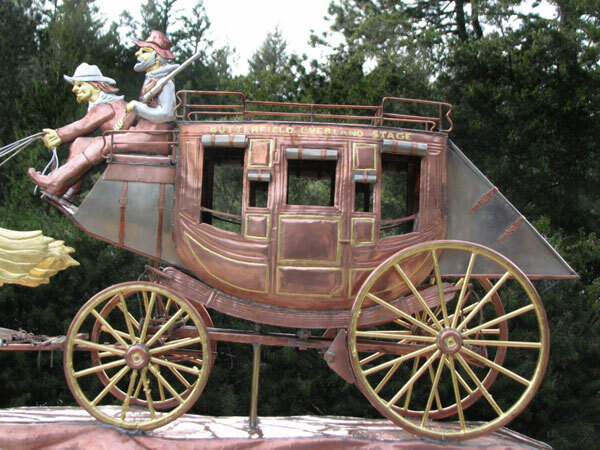 As part of our research, I visited the headquarters of Wells Fargo Bank in San Francisco and took literally hundreds photos of one of their old stagecoaches and of a lovely bronze stagecoach sculpture, which was extremely helpful in figuring out the harnesses and rigging. 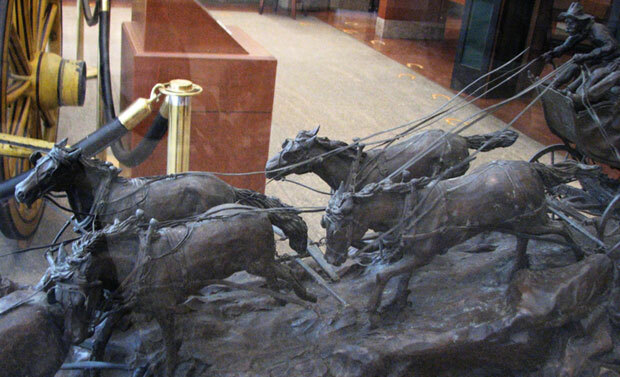 The lobby staff was very gracious in letting me wander around taking photos. 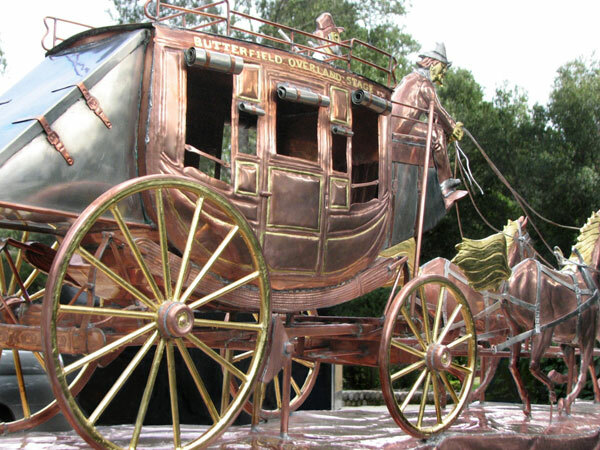 Fortunately, our customer was actually having a hand built full scale replica of one of these stagecoaches built and sent us a set of plans plans to help us replicate it as accurately as possible. 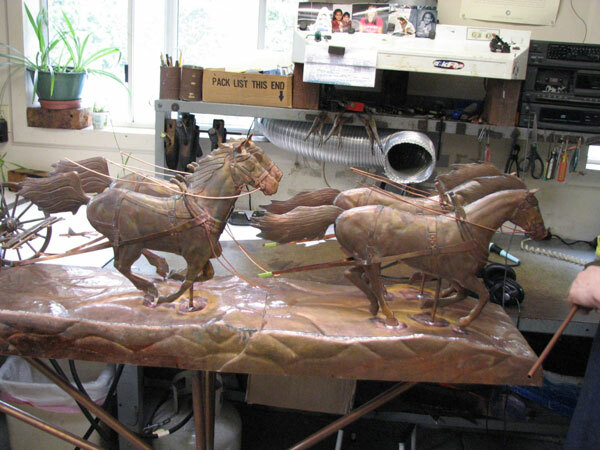 Probably the most challenging aspect of the design process ended up being the rigging for the horses, which we also wanted to portray as accurately as possible. 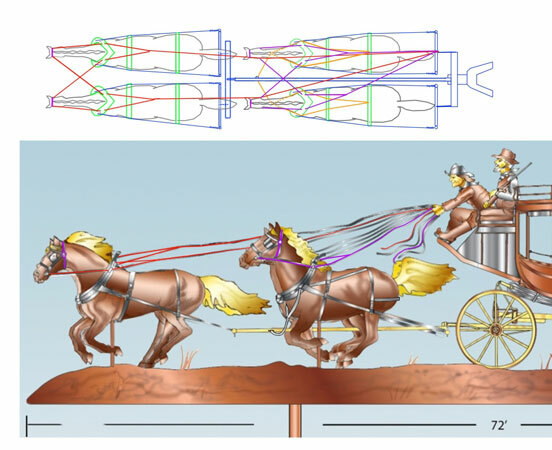 There is a color coded drawing in this slide show detailing the rigging. 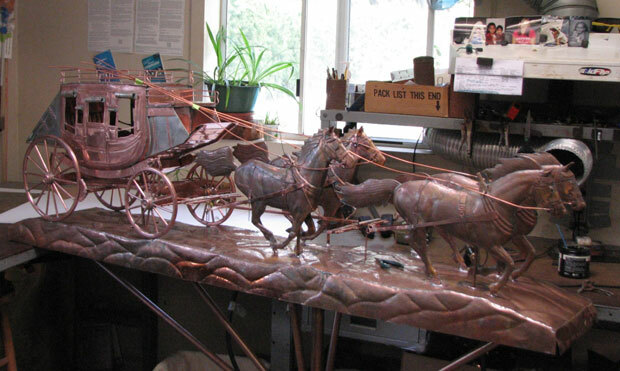 This was truly a collaborative project. 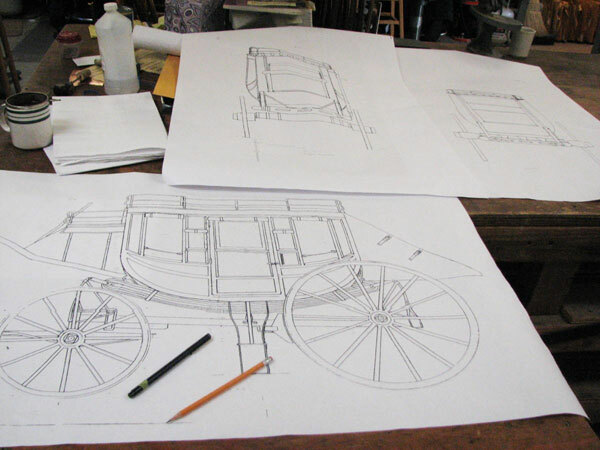 Three of us working on the design: Thomas, who has a strong background in mechanical design worked on the stagecoach drawings, I did most of the research, image gathering and harness details, and Lee, a most accomplished digital artist who helps with some of our custom design work when I get backed up, did the overview layout drawings. 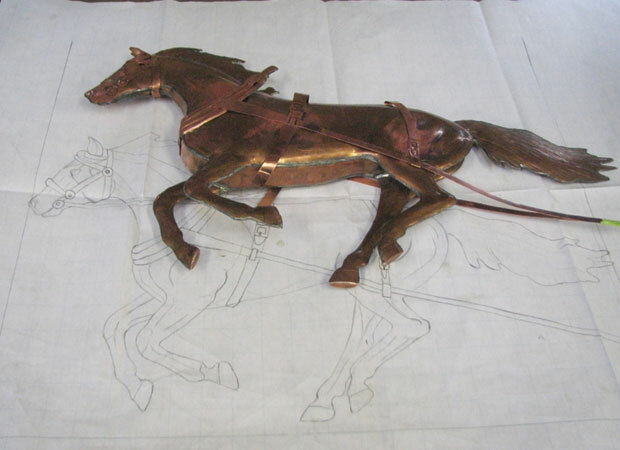 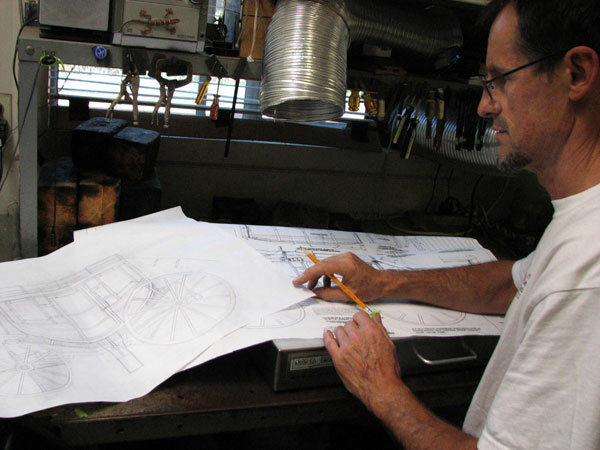 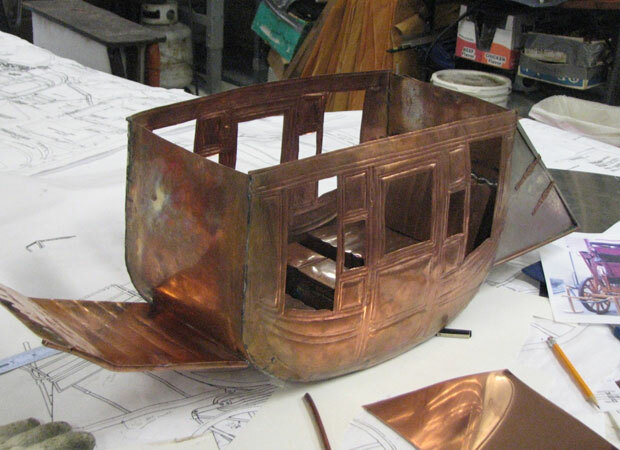 The set of images included here shows the process of developing the Stagecoach Weather Vane design from concept to finished design. 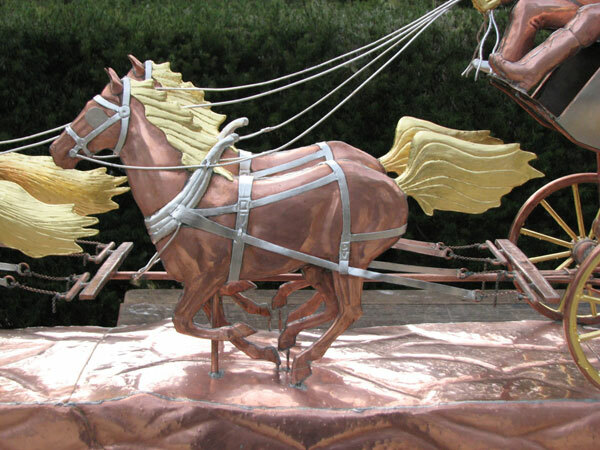 Be sure to take a look at the complicated rigging and notice the repositioning of the horse’s legs. 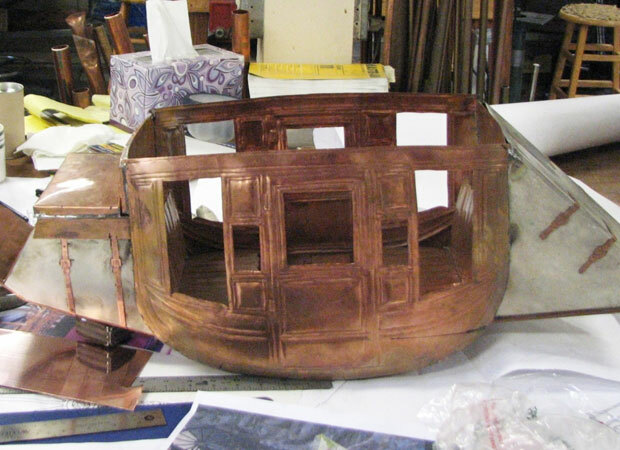 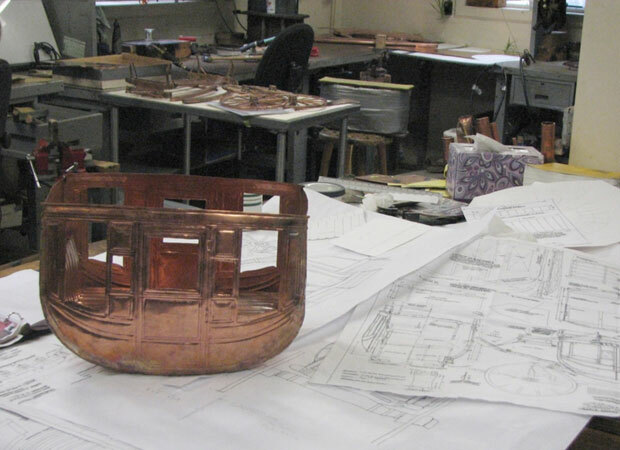 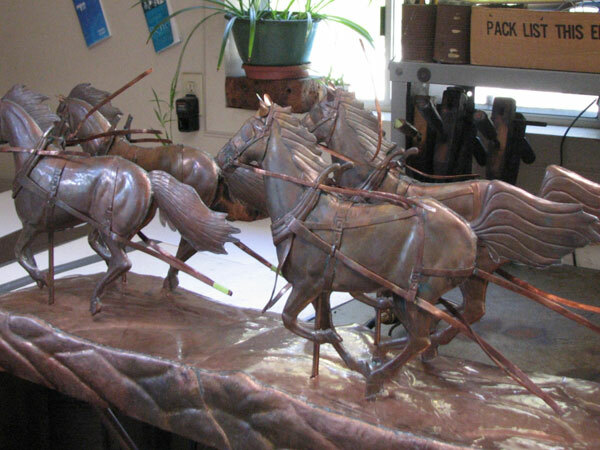 Another unusual aspect of this weathervane process was splitting up the project among our weathervane makers. 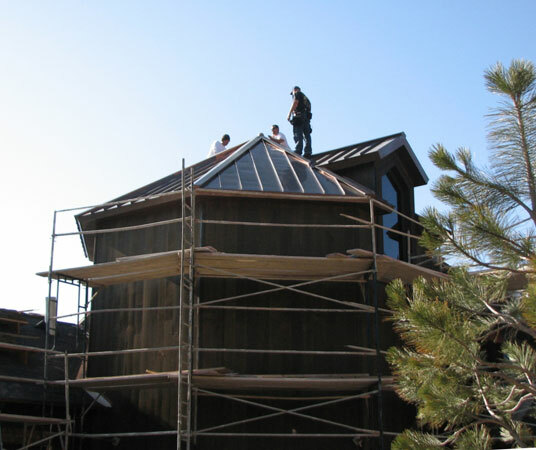 Working alone, it would have taken at least five months to build but by splitting it up, we were able to finish it in just under three months. 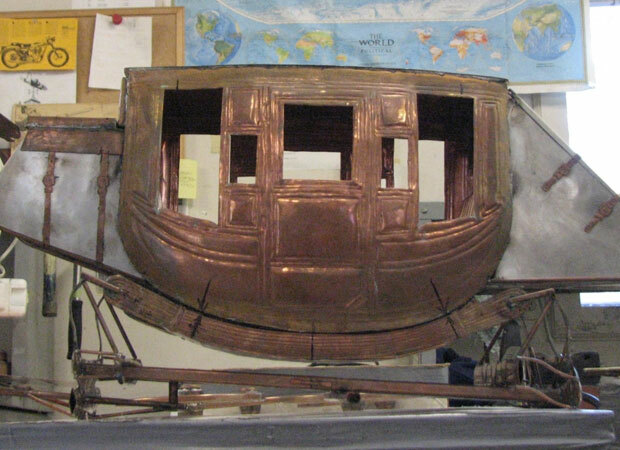 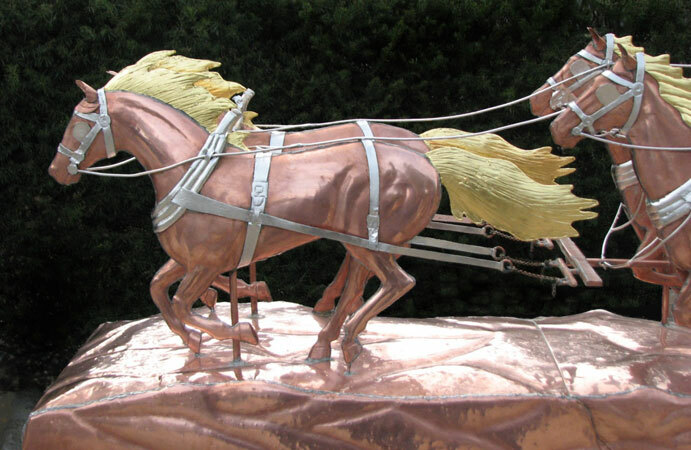 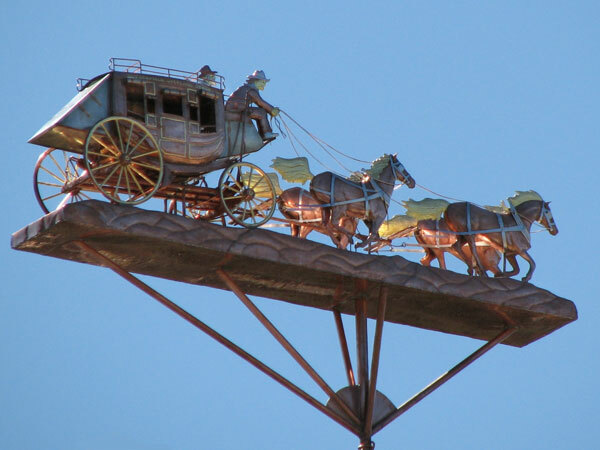 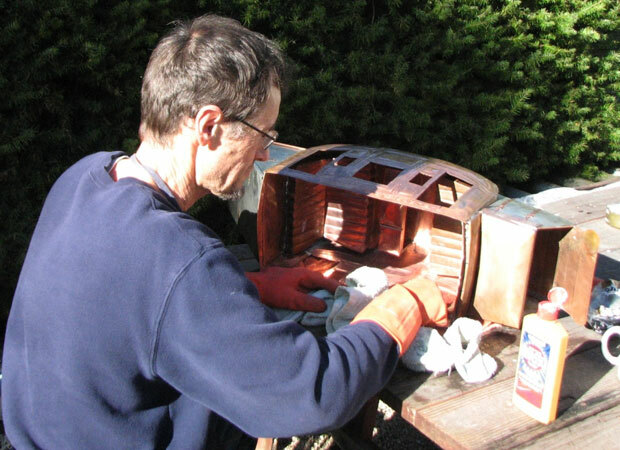 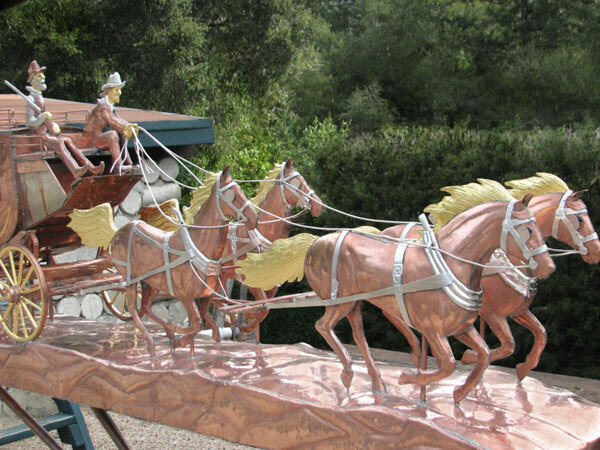 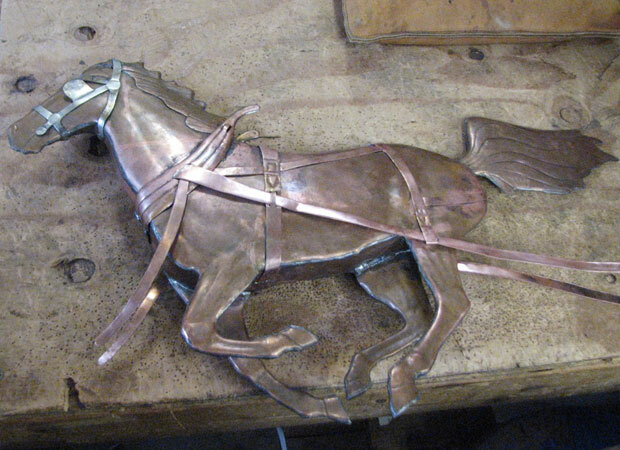 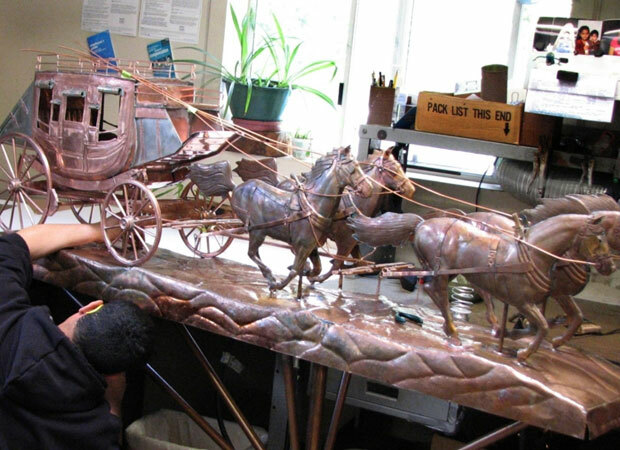 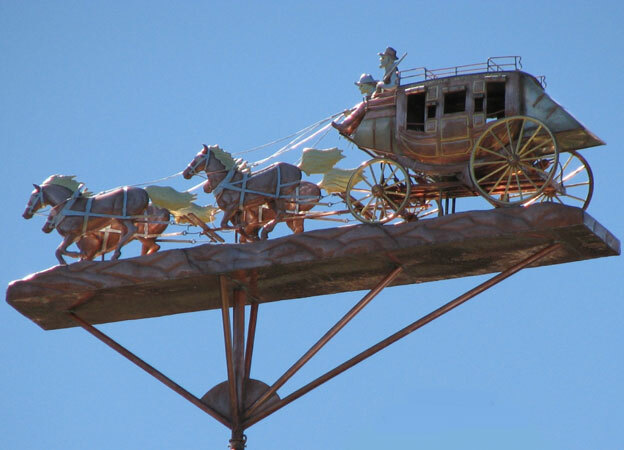 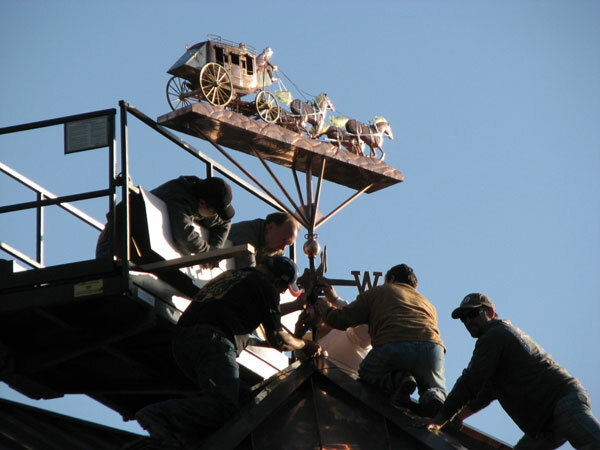 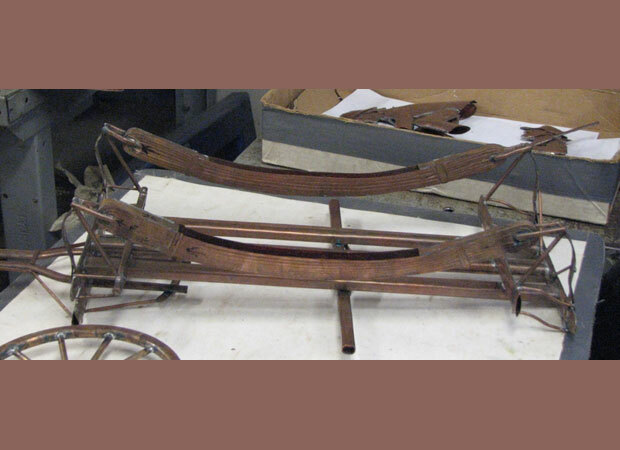 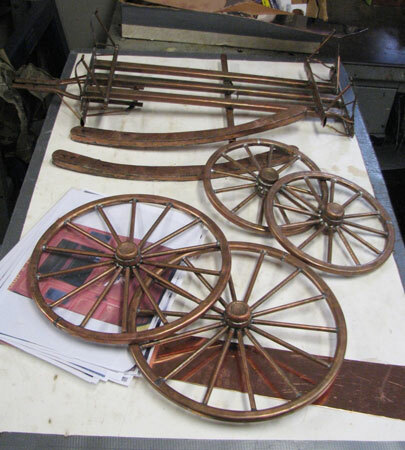 Thomas crafted the stagecoach, Jeff, the two drivers, and Victor made one team of horses, built the framework for the weathervane, attached all the sculpture pieces to the platform and tied together all the rigging. 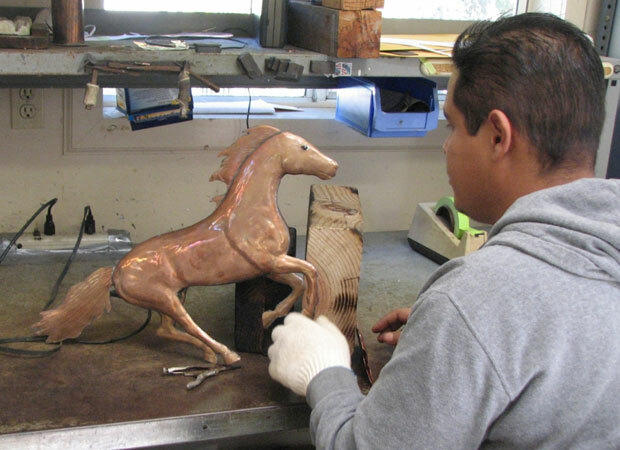 Rolando, Victor’s brother, also made a team of two horses. 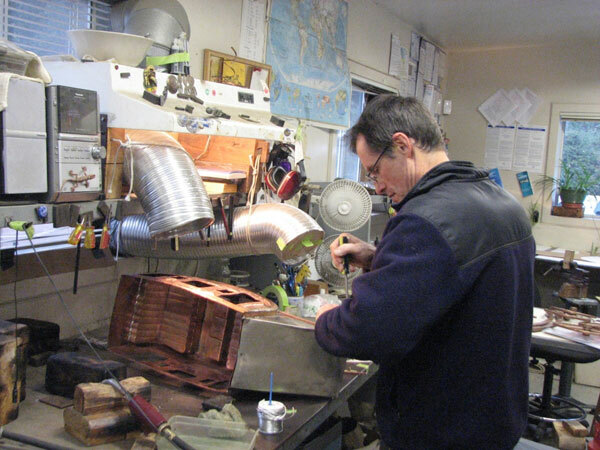 Russ, our gilder extraordinaire, did all the final polishing and gold and palladium leafing. 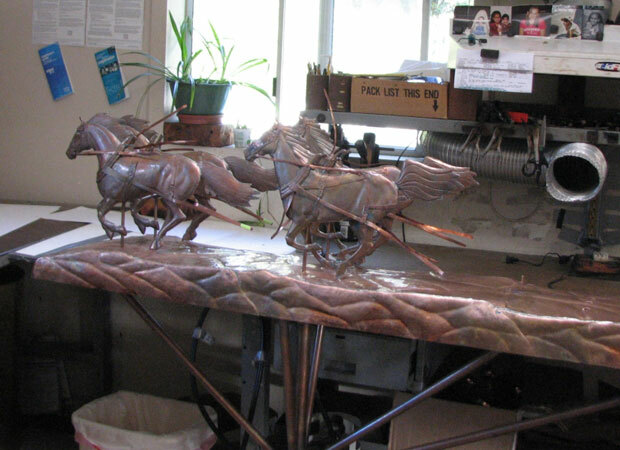 While the finished sculpture piece was quite durable, there were many individual pieces to it. 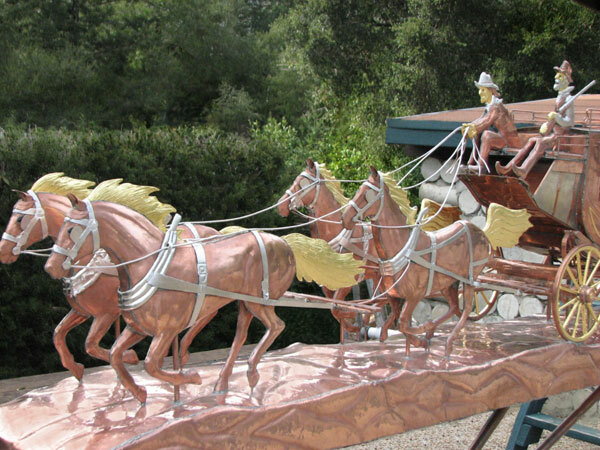 For this reason, we decided to hand deliver it to our customer’s home in Southern California. 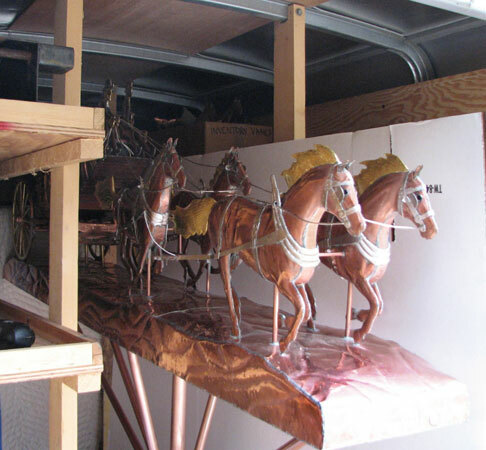 We carefully packed it in our trailer and headed south. 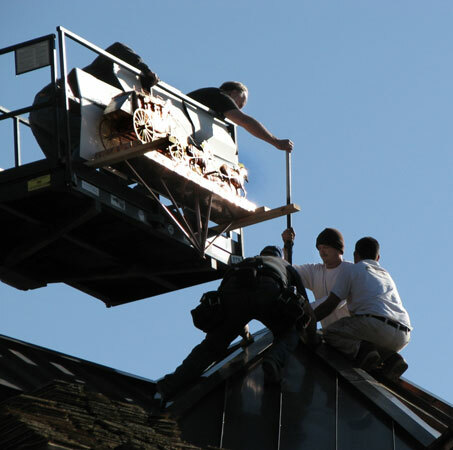 The images here show the actual installation which required a crane to lift it with Ken, my husband, and several of the construction workers settling it into place on the roof. 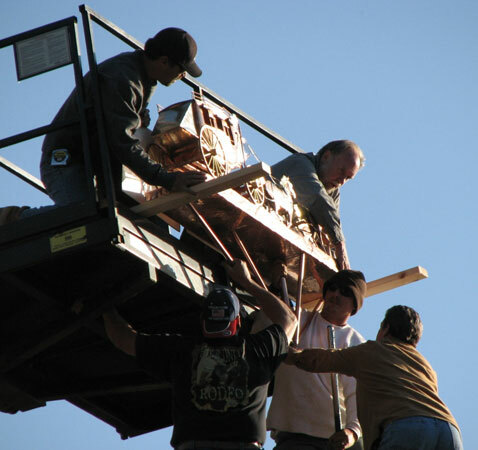 While fairly straightforward, wresting a hundred pound sculpture piece into place 60 feet up had those of us on the ground holding our breath!